Associated Press The Cubs' Javier Baez, center, is congratulated in the dugout by teammates after hitting a home run in the sixth inning Thursday. In the 10th, Baez's bunt single broke a 3-all tie. 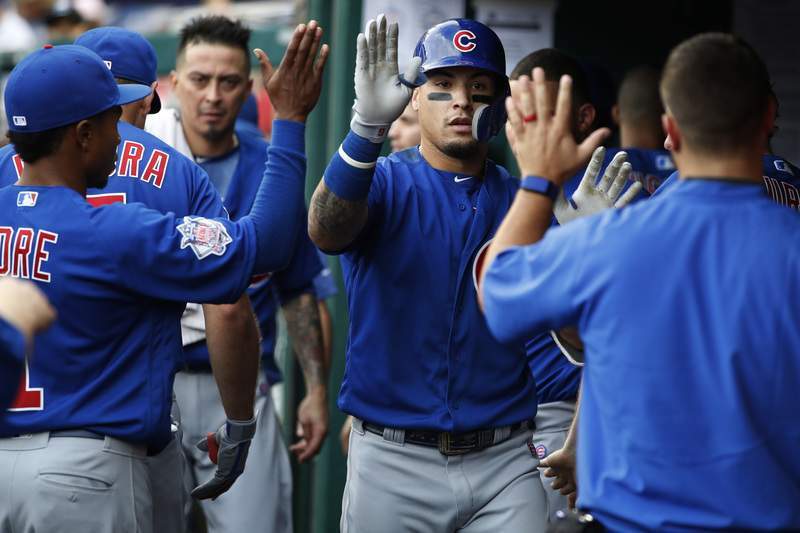 WASHINGTON – The Chicago Cubs got nearly everything they wanted out of their day trip to Washington to face the Nationals, and Javier Baez was in the middle of nearly all of it. Reliever Pedro Strop's hamstring injury while running the bases was a notable exception. Baez delivered the go-ahead run with a bunt single in the 10th inning as Chicago beat Washington 4-3 in a makeup of a game postponed over the weekend. Baez, an MVP candidate, also homered and drove in three runs. He has 31 homers and leads the NL with 103 RBI. Chicago stretched its lead in the NL Central to 11/2 games over idle Milwaukee. Washington fell 81/2 games behind Atlanta in the NL East. Strop (6-1), who pitched 12/3 scoreless innings, was set to pitch the 10th after the Cubs took the lead and was allowed to bat with the bases loaded and one out. In his second at-bat of the season, he hit a sharp double-play grounder to third and pulled up while running to first. Cubs manager Joe Maddon said Strop would undergo an MRI and is unlikely to be available today. Strop has been Chicago's closer since Brandon Morrow was placed on the disabled list July 18. Strop is 11 of 13 in save situations in that span and has 13 saves. Kris Bryant doubled with one out in the 10th against Sean Doolittle (3-3) and moved to third on ex-National Daniel Murphy's infield single. Baez bunted just to the right of first baseman Ryan Zimmerman to score Bryant, who did not anticipate Baez's choice. Also caught off-guard was Doolittle, who pitched a scoreless ninth before returning for the 10th. Randy Rosario worked a perfect 10th for his first career save. The game was a makeup of Sunday's rainout. Washington returned home between stops in Philadelphia and Atlanta, while Chicago wedged the game in between a pair of three-game home series.